Skype Voice Changer in real time will be the main topic for today. If you want to have some irresistible fun in a real time Skype chat, follow our tutorial and change your voice to different other voices. Voice Changer Software guarantee that we only provide the best content and this software is one of the best of the best. 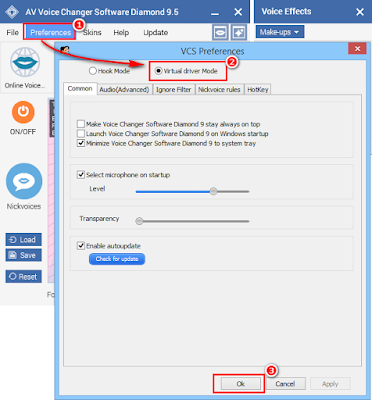 This tutorial will guide you on how to easily use voice changer for Skype while chatting and talking in a call by simply using Voice Changer Software Diamond 9.5 (VCSD9.5). You will be amazed by your own voice, even perfectly fool other people with additional voice effects and background effects. - You: "I'm at the sea"
- Friend: Really? wow, I can hear the ocean. - You: Meet Sophia, a girl I just met. *Change your voice to a sweet woman voice. - *Sophia: Hi, nice to meet you. - Friend: OMG, it's awesome. Nice to meet you too, Sophia. 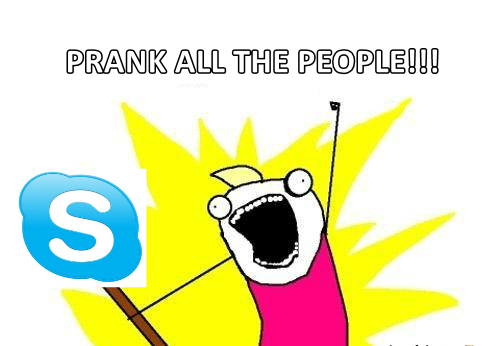 Skype voice changer: prank all the people!!! This simple tutorial contains 4 easy-to-follow steps. Let's get started! Now, AV Virtual Audio Driver mode has been applied to our voice changer for Skype. It will focus solely on the application you connect with. 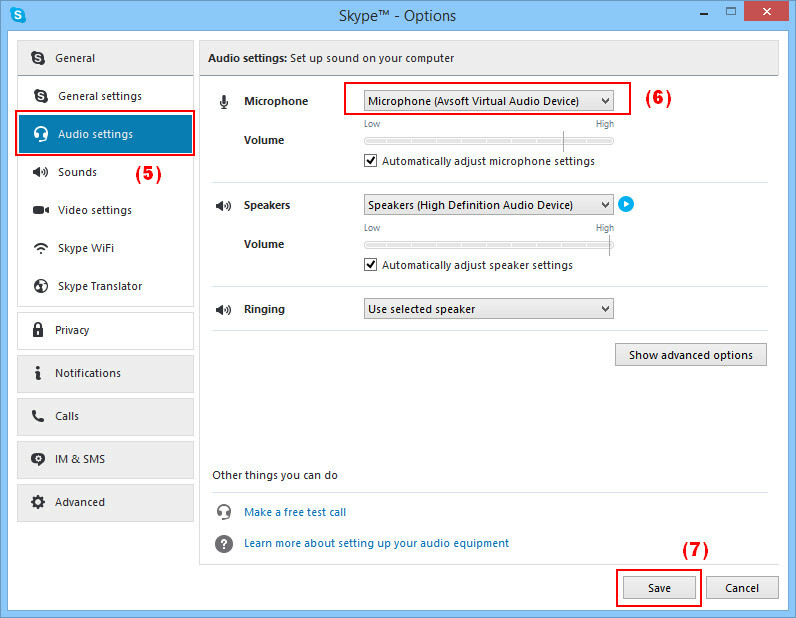 Now, AV Virtual Audio Driver has been used as your main audio driver in Skype. This means that voice changer has been connected to Skype, ready for a funny real time talk. Are you excited now? You are almost there, just a little bit more. Speak to your microphone to see how it's currently sounding. - Equalizer panel (13) will appear, you can choose your preset here. To have the best voice, just make adjustments until you are satisfied with the output. This is really easy to do, even with just a few clicks, you can make a whole completely new voice. All morphing effects are now ready for your ultimately funny Skype calls with friends and family. Now, return to Skype. Pick your first "victim" and start a voice chat session with him/her. 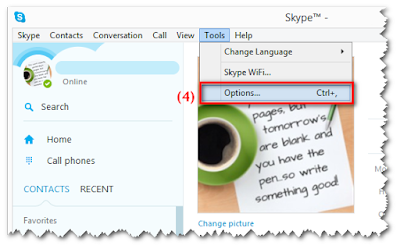 VCSD 9.5 is now working as your Skype voice changer. 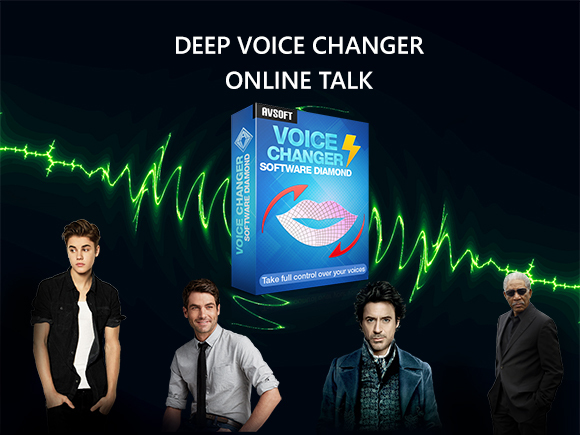 Change your voice in real time to Morgan Freeman, Barack Obama, Chipmunk or anything such as ghost, a dog, bear, bird, etc and surprise everyone on Skype. Cool, right? And you can even record the conversation to enjoy it later. Excellent!!! As long as the AV Virtual Audio Device works as main driver for your microphone, you will have a very powerful voice changer software ready for every talk. Halloween sound effects will always be a great way to have fun in the most delightfully haunting night. 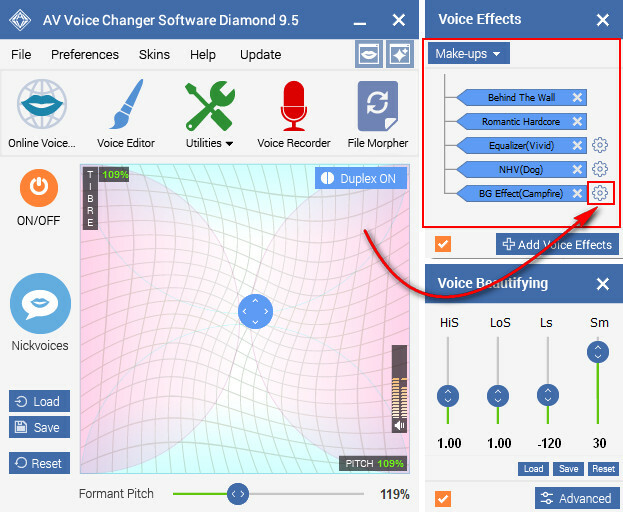 Scary sound effects along with Voice Changer Software Diamond 9.5 will absolutely be a perfect match to create the best scary voice changer you have ever found. 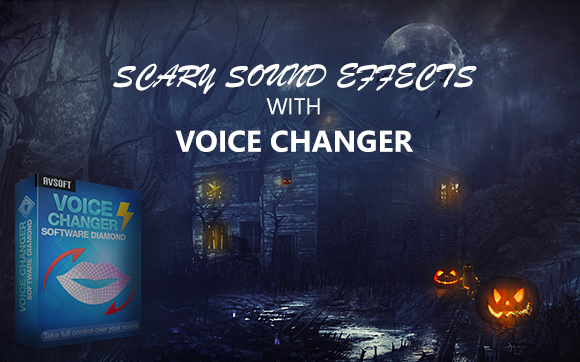 Show your true evil color and have fun in online voice chat with this scary voice changer. If you're planning to prank your friend at the spooky midnight, here is our cool tip for you! What can this scary voice changer do? 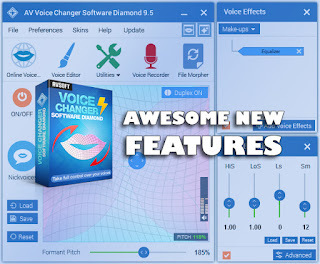 This scary voice changer, a.k.a Voice Changer Software Diamond 9.5 is an all-in-one voice mastering tool that can change your voice in real time and connect to chat programs such as Skype, Viber, Discord, etc. for an online voice chat. Cool, huh? 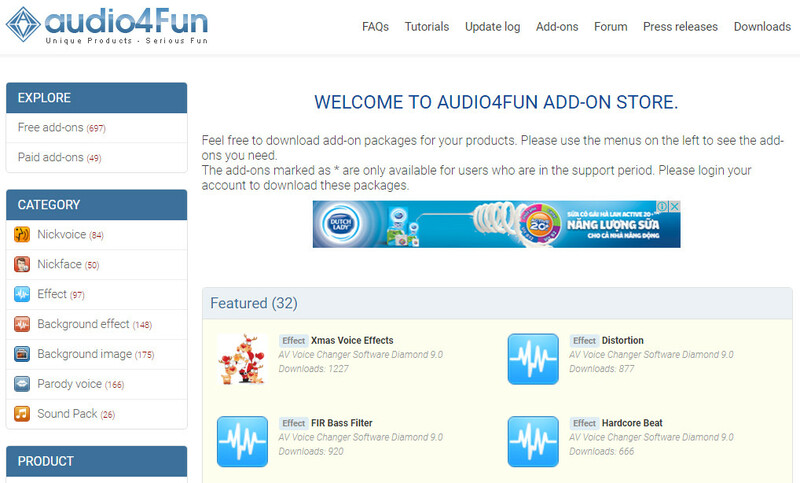 Not only that, you can also download more add-ons from the Add-on Store. These add-ons are completely free and can be easily added up to the software's initial library of effects, voice presets and many other filters. This means that you can add a new scary sound effect, while transforming your voice and talk in real time. Perfect for a scary Halloween night. But it does not stop at just online voice chat, you can also manipulate audio files into various styles with other two features. 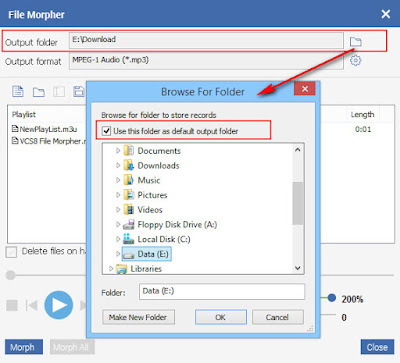 - File Morpher to convert audio formats and morph audio files. - I know, being kissed by a vampire is a pain in the neck. Why not let me kiss you? - Let's have a fun chat. A video with talking animation will always need voice-overs. And how do you record different voices for the characters? 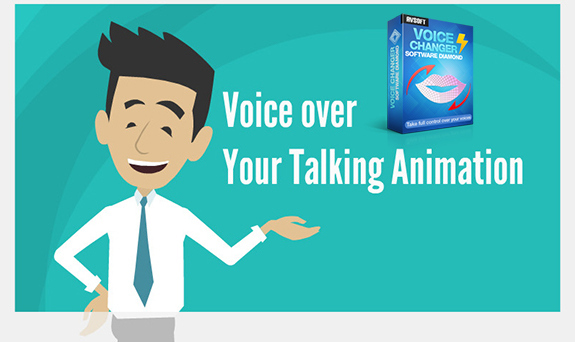 We will show you, a voice changer ware that can be connected to GoAnimate, change your voice to many other voices, from male to female, animals and more. Check it out now. Call Voice Changer has been finding a solution for an animation cartoon. In this tutorial, we will introduce to you GoAnimate, a very easy-to-use drag and drop tool to create your flash animation, along with AV Voice Changer Software Diamond 9.5, the ultimate voice changer to change your voice to any voice in real time as well as many integrated audio editing tools in the software. GoAnimate is a animation video maker, which is used on a browser. With this tool, you only need a web browser, a few drag-and-drops adjustments and then, voice over your characters. This is a very easy-to-use that is suitable for anyone. No need for complicated video editing skill. If you want to want a whiteboard animation, create avatar talking or some simple scenarios without having to spend so much time, GoAnimate will be a great choice. This is the software that can help you do voice-overs in many voices for your characters in Goanimate. Just connect the software to GoAnimate, and you are ready to go. With this software, you will be able to talk like a little girl, a grown-up man, a grandma, a sweet-voiced female, even famous characters like chipmunks, Darth Vader, Morgan Freeman and many more. You can even become a real voice actor for your project with ease, no need to find a complicated solution. Don't worry, the software is the all-in-one application for every audio needs. 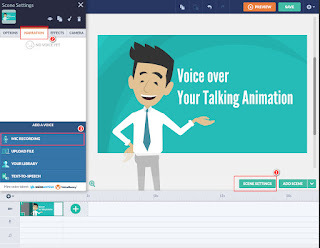 You will find a huge library of effects, built-in audio recorder/converter/editor to perform all needed tasks for the talking animation with GoAnimate. After downloading AV Voice Changer Software Diamond 9.5 via the link above, install and launch the software. - On main panel, choose Preferences (1). - In VCS Preferences window, select Virtual driver Mode (2). This mode will help voice changer focus better on the software it is connected to. Therefore, the voice quality will also be better. - Go to https://goanimate.com/ and start your video project. - Select the scene that you want to do voice-over and choose Scene Settings (1). - On Narration tab (2), select Mic Recording (3). - Click Allow. GoAnimate will be able to use signal from your camera and microphone. - Choose Microphone (Avsoft Virtual Audio Device) (5) in the drop-down list. - Close the dialog box. 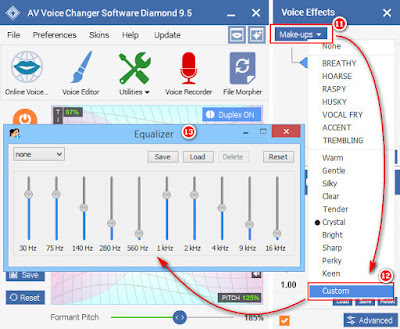 To change your voice with AV Voice Changer Software Diamond 9.5, you only need one click! Besides, there is a more creative way to change your voice: Voice Morpher feature. You will have complete control over the age and gender of your voice, plus tons of voice effects, background effects, an equalizer and even vowel enhancer to define your voice to be more unique. And now, it's time to make your own talking animation with GoAnimate and then do voice-overs for your characters with Voice Changer Software Diamond 9.5. Remember to write down your scripts first. Have fun and enjoy! 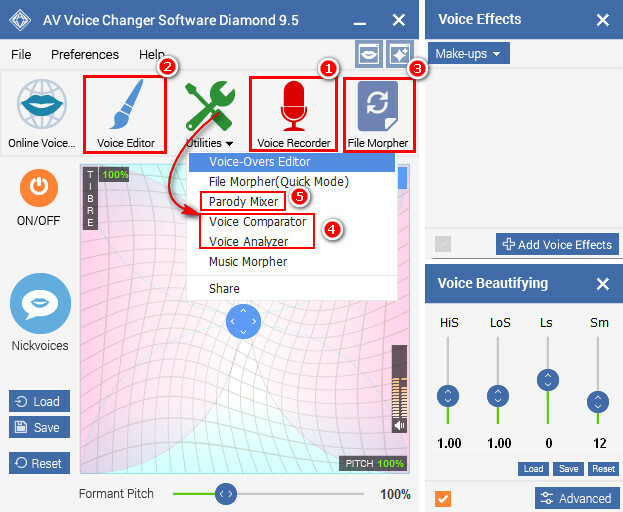 >> AV Voice Changer Software Diamond 9.5: What's New? Who can resist the curiosity of using a real time voice changer for PC with effects? Modify your voice in any voice chat software with a microphone in real time. Play some fun tricks with your friends and family by talking in a strange voice while having a live conversation, add in some effects to make it even more realistic and finally, record to enjoy it later. Are you excited? Everyone has their own real voice, whether it is in high pitch, fry, warm, gentle, unique, weird and many other ways to describe. But not this time, you will actually have... almost unlimited possibilities to change your voice to another one, including an opposite gender, ghost, dog, cow, bear, Morgan Freeman, Batman, Darth Vader or even... your mom and dad. The software that is gonna help us is called AV Voice Changer Software Diamond 9.5 - the all-in-one application for voice modification and audio processing. 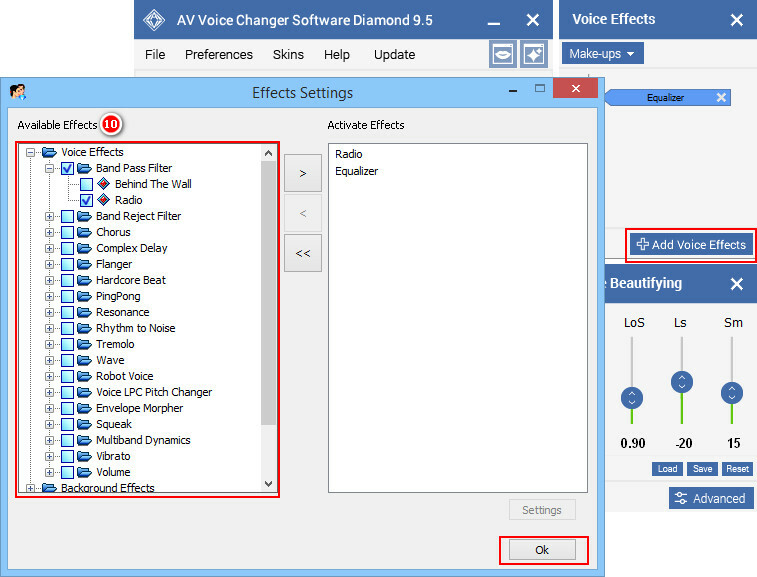 What is AV Voice Changer Software Diamond 9.5? 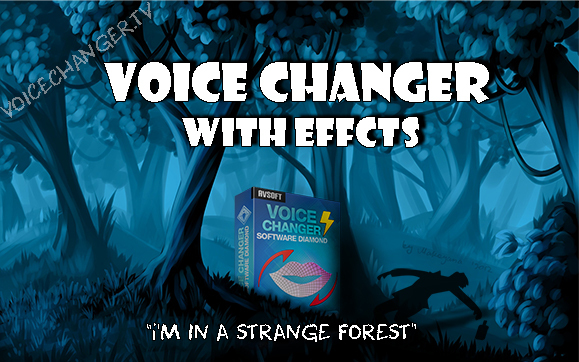 Obviously this is a voice changer software to help you change your voice to another person's voice with ease. But this one, stands out from the crowd with a whole lot more features that the others cannot compare to. What is special about this real time voice changer? - It has a Pitch-Timbre graph to easily change the age and gender of your voice. This gives so much more options and is easier to use compared to other voice changers. - Voice Editor, Voice Recorder, File Morpher, and many Utilities to conveniently edit, record, convert audio files and many other uses. - Voice Effects and Voice Beautifying to improve quality of your voice and add effects into the real time chat as well as pre-recorded audio files. License: FREE Trial and license with 30-day satisfaction guarantee. AV Voice Changer Software Diamond 9.5 can be used in voice calls, online voice chat and even game online in real time. When you talk, the software will capture your voice, modify with advanced audio processing algorithm, and then produce a new voice with morphing settings based on your choice. This process happens instantly the moment you talk into the microphone. Thus, a real time voice changer. This voice changer can be used with any voice changer applications such as voice changer for Skype, Curse chat, TeamSpeak, Discord, etc., game platforms like Steam, Eve Online, or even other audio recording software and audio software such as Goldwave, etc. 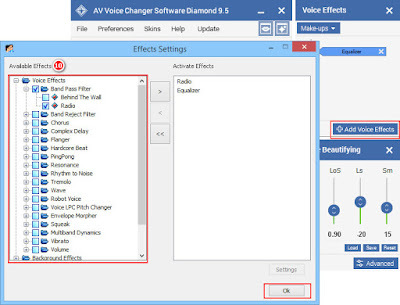 AV Voice Changer Software Diamond can be connected to almost all applications and what's more, you can also change your voice during phone calls. It works in real time, but how do we make use of the voices? How to adjust the options quickly for instant changes? Here is the answer: Nickvoices. Inspired by the word "Nickname", Nickvoices were born to help users quickly adjust their voice with ready-to-use voice preset in just 1 click. Isn't it amazing? You can change your voice from a dude to a grandma, a charming lady, a baby girl, a gentleman, even a dog, bird and many other voices. Moreover, if you want something out of the box, then you can also adjust the settings freely with Voice Morpher feature. Let's take a look at the Voice Morpher feature to see why I say unlimited possibilities. It's really true. 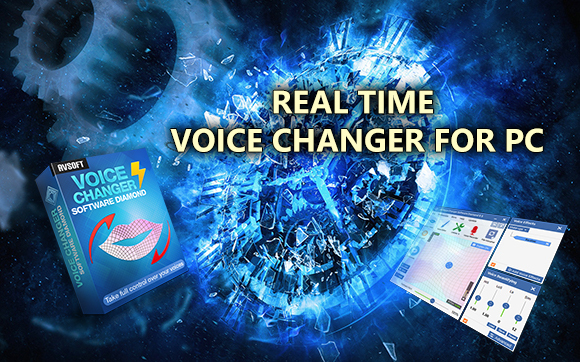 Voice Morpher of real time voice changer. Can you see the 3 highlighted areas? They will be the place to play with your voice. This is where you change the age and gender of your voice. - You can sound younger/older when moving the pointer up/down to change Timbre. - Move the pointer left/right to sound in lower/higher Pitch. 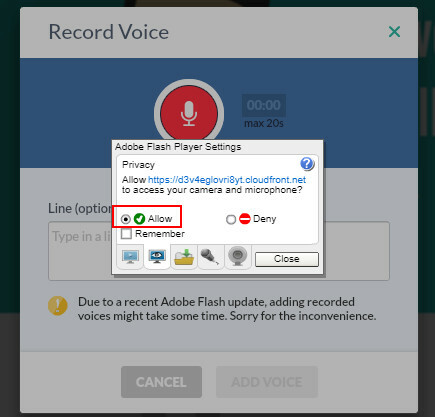 And very convenient, there is the Duplex button to check what your voice sounds like. This is where you add voice effects, background effects, adjust Equalizer and many other things to your voice. It has the Make-up presets to form a characteristics to the voice and this is phenomenal. - The best thing about this feature is that you will be able to see which effects are on or off right within the panel. If the tag name is in blue, then it's on, and when it's off, the tag name is empty color. - Next to each tag name, you will the a small button to adjust settings for that effects. Very useful, it's the shortest way to make changes to how the effects are applied. This is also an important part in Voice Morpher: improve your voice. - With this, you will be able to change the main formants of a human voice, thus reproducing such rich voice qualities as soft talking, rough, breathy, creaky, hoarse, etc. - Sometimes, it can even produce an accent. 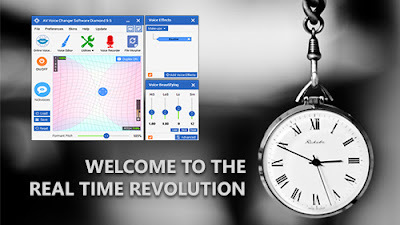 Like the Voice Morpher is not amazing enough, this software also has a HUGE library of effects: 30 Voice Effects, 70 Background Effects, 17 Non-human Voices, 40 plug-in Audio Effects and more. For example, apply traffic jam background effects and tell your friends on Skype that you are stuck in the street. They will completely fall for it, hahaha. I only provide you the best content, so believe me that the effects are so realistic it can hardly be seen through. Remember: you can also download more Nickvoices and Effects from the Add-on Store. The company has an impressive amount of free add-ons. There are many good ones there, for example, I find the Darth Vader breathing sound, Xmas voice effects are very interesting and cool. There are more, but I have only tried these two. The Add-on Store's amount of effects is just inspiring. Check it out and I believe you will also like it as I do. Not just a normal voice changer, this is the all in one voice changer that has many other practical features that no voice changer in the market has. This is real and tested information. - Voice recorder with voice changer (1): record your voice and save it in any voice you want. - Voice Editor (2): edit/cut/split/merge/copy/paste/ add effects to pre-recorded audio files with ease. This feature does not take time to learn how to use. That's a perk. - File Morpher (3): this is the bomb! You can morph the vocal of a song, alter the audio files, convert file formats in batches. Extremely handy when you need to morph a lot of files at the same time. This feature has two mode: Quick Mode and Full Mode for different needs of users. Quick Mode can be found in Utilities. 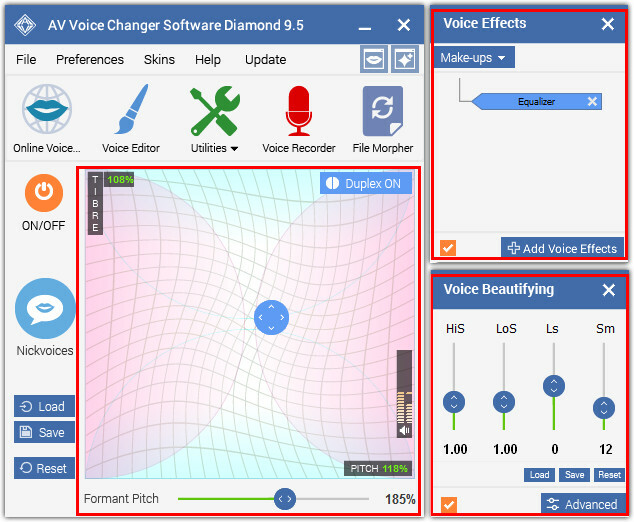 - Voice Analyzer/Voice Comparator (4): analyze your voice and compare it to a target's voice, then suggest you the best morphing settings. - Parody Mixer (5): mix your voice into a Hollywood star, famous celebrities. You can download more packages from the Add-on Store and mix up to 4 voices to create a completely new one. Those are the reasons why it has a higher price compared to the other voice changers. But to me, it's very worth it. Instead of spending time and money to look and buy other programs with the same functions, it is integrated right within the software. And when I made more research into this, the price of AV Voice Changer Software Diamond is also lower for the sum of other software to achieve the same result. That's why, this is the best bang for the buck to me. The logic is: most of the time, you want to buy the best products for the least money possible. But, the hard truth is the higher the quality, the higher the price is, right? However, please notice that: the cheap products you will buy will have shorter life span, and in this case, less features. Therefore, just think about it, a higher quality may not be as cheap, but it can last longer and again, in this case the software has many more great features. >> And finally, you will realize that the amount of money you buy cheap products will accumulate and eventually, it is obviously more expensive than the good ones compared in functionality as well as the look. All in all, AV Voice Changer Software Diamond is a great real time voice changer for PC. As my motto is bring the content that my readers find useful. you can be rest assured that I found it good, then you will, too. This update can be considered as one of the biggest, revolutionary step to a new future of the company with a simple "s" on the links. If you do not know why this simple "s" is that important, then let me explain. You can see the URL with Https at the address bar on your browser. And don't worry if you don't use Https at the moment, all Audio4fun's URLs starting with Http such as http://www.audio4fun.com/ will redirect to https://www.audio4fun.com/. And what's more, did you know the new build 9.5 has many must-read big changes? 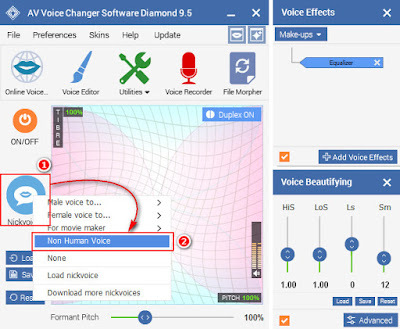 -> Visit this article: AV Voice Changer Software Diamond New Build 9.5: What's New? 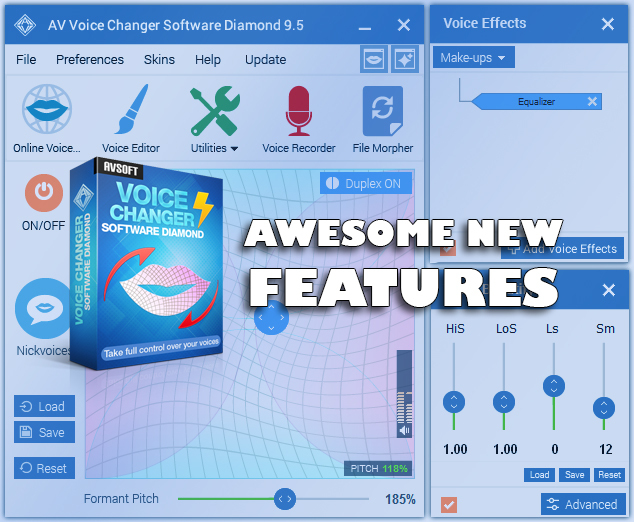 This is the ultimate voice changing software that can change your voice to any voice you want, and also various audio activities that no other voice changer can do. You can sound like Morgan Freeman, Barack Obama, Darth Vader, or even imitate the voices of your friends/father/mother/sister/etc. with ease. There are also more than 30 Voice Effects, 70 Background Effects, 17 Non-human Voices, 40 plug-in Audio Effects built-in the software and even more are being upgraded regularly from the Add-on Store. 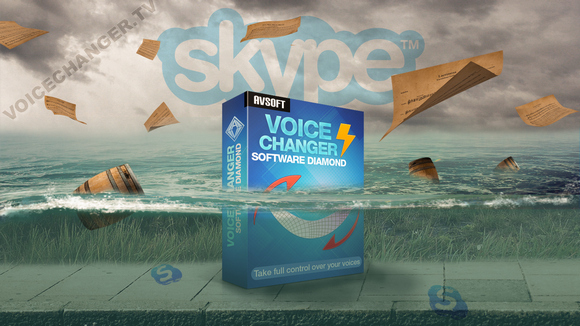 "So, what makes AV Voice Changer Software Diamond different from other competitors?" This is a very good question. Many users want to find out which voice changer they should use, which one has the highest quality, which one gives the most from that price range and so on, many questions. Voice Morpher: modify the age, gender and voice attributes of your voice with the Pitch-Timbre graph. Moreover, the ready-to-use voice presets “Nickvoices” can change your voice in just one click. Voice Effects: hundreds of voice/background effects waiting to be explored, and you can conveniently control the effects within one panel. 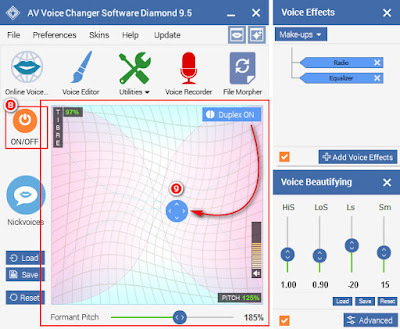 Voice Comparator and Voice Analyzer: analyze and compare your voice to a target’s voice then use the suggested voice morphing settings to best mimic that voice. Parody mixer: mimic celebrities’ voices or mix up to 4 voices to create a completely new voice. Voice Editor: freely edit/cut/split/copy/add effects to your audio files. Voice Recorder: record your voice and capture your voice from any program or Internet Radio. File Morpher: convert and morph audio files in batches, available in two modes: Quick Mode and Full Mode for all your user needs. This means that you can conveniently transform, edit, mix, morph the pre-recorded audio files with settings and effects from voice changing features and apply to your files. Do you want to see some screenshots? - Effects now appear along with their categories so that users can know more easily what kind that effect is. In this example, you can see Voice Effects will have no category, we can see: Equalizer, NHV(Non Human Voice), BG Effect(Background Effect). - Appear side by side with each effect is an icon to edit directly their settings. With effects that have no value to adjust, there will be no icon. So what does it matter to edit settings by clicking that icon? The reason is that it will be absolutely faster and more convenient to control and adjust the settings for users. In File Morpher feature with Full Mode, when you choose an output folder, there will be a new option to Use this folder as default output folder. What does it mean? This means that it will be your default folder to save files every time without having to select again in the next time you use this feature. Moreover, in Quick Mode, you will automatically save all your morphed files into this folder. Quickly access all your files without looking for the save location of each one. Convenient, isn't it? Want to try out these two new awesome updates? You can check them out with the download link below. 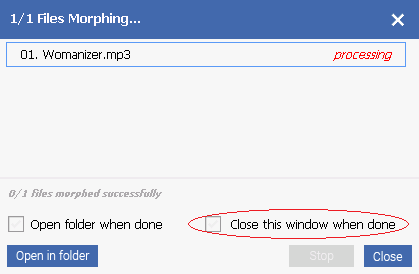 New option to close the File Morphing window when done. When morphing your audio files, this File Morphing window will appear to show you the process. 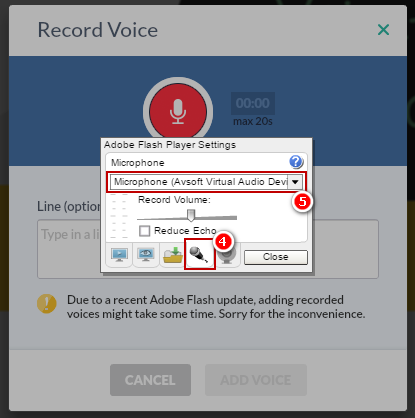 At this new update, after successfully morph the audio files, this window can be closed automatically if users choose this option -> Save a step if you don't want to close it manually. And thus, those are the three changes in the latest update. There are also a few minor bugs fixed. Audio4fun always puts the benefits of users as the first priority by updating new features, enhancing and improving the software to be more and more convenient as well as friendlier for users. 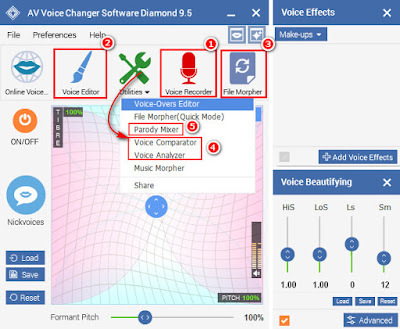 Have fun with AV Voice Changer Software Diamond 9.5. I'm sure most of us have tried VoIP calls, video chat at least once from Skype, Viber, ooVoo, TeamSpeak, Discord, Curse or any program out there. That must have been fun, but did you know? 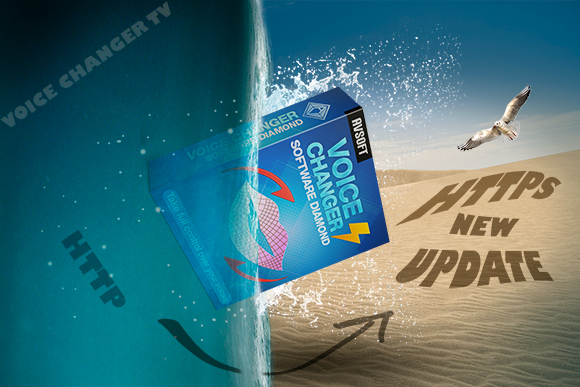 You can make your video chats and those online calls and even funnier by connect your program with a voice changer with effects. In this tutorial. 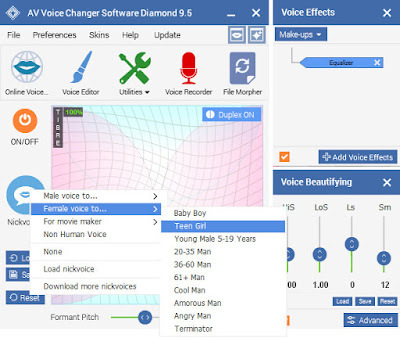 Voice Changer TV will show you how to use AV Voice Changer Software Diamond 9.5 (VCSD 9.5) to make a funnily flamboyant surprise in your internet calls. Using voice changer with effects, you can easily add voice effects, background effects, choose a voice you want and even control sound quality in real time. Imagine to change your voice from a man to a little boy who is lost in a traffic jam with realistic sound effects. Anyone talking to you will be fooled without knowing. 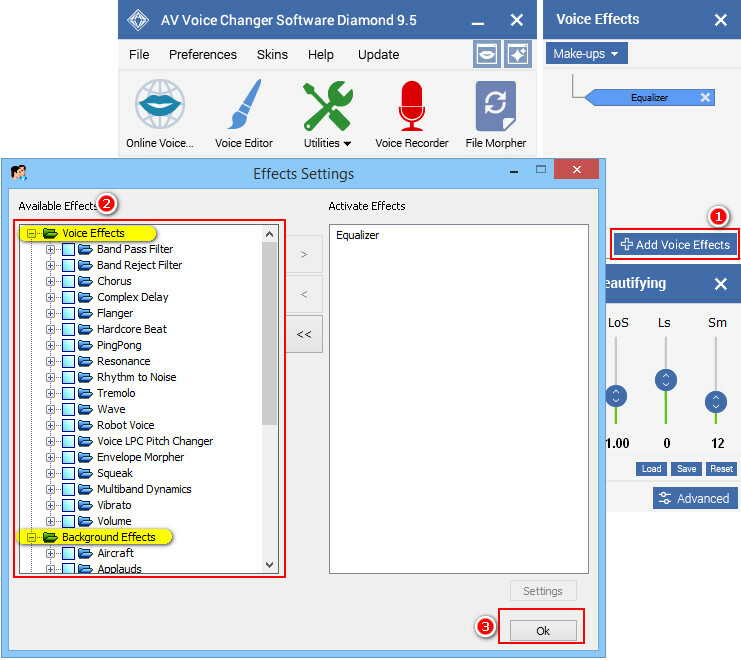 This is a voice changer with effects, but not only so, AV Voice Changer Software Diamond is the all-in-one voice changing software with powerful features to satisfy every needs of users. You can be anyone, imitate any voice. You will have the chance to become a real voice actor, audio home producer, talk like Morgan Freeman or even change voice to a girl to hilariously flirt around. - Pitch-Timbre graph: change the age and gender of your voice. 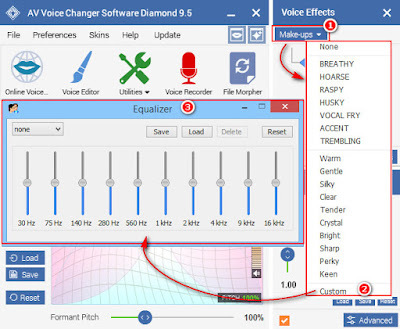 - Nickvoices: change your voice in just one click with ready-to-use presets. - Voice Recorder: record your audio right within the software. - Voice Editor: cut/split/merge/copy/paste/add effects to any audio files. - File Morpher: morph/modify vocal/convert format/ in batches. 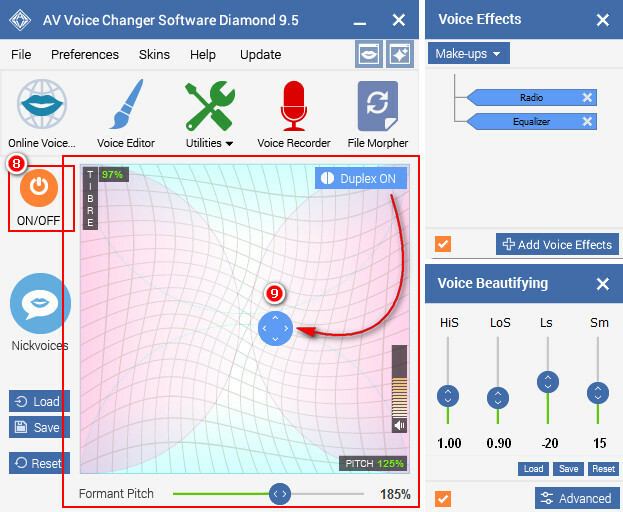 - Utilities: Voice Comparator and Voice Analyzer can analyze and compare your voice to a target to mimic that voice. Parody Mixer can change voice to a parody voice, you can also mix up to 4 different voices to create a completely new one. For more information about VCSD 9.5, click here. 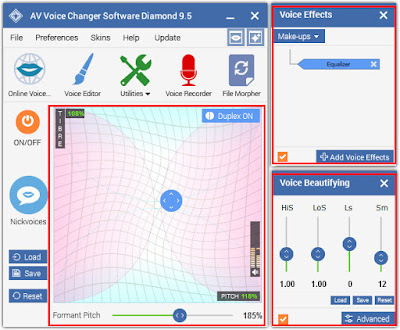 Av Voice Changer Software Diamond has the system of changing your voice to the built-in ready-to-use voices called "Nickvoices". - Choose your favorite Nickvoice (2). And that's it, your voice is now changed with just a click. 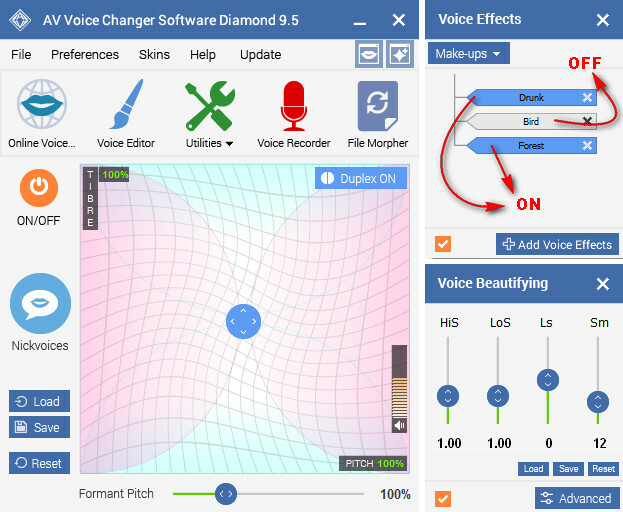 Currently, the software can change your voice from male to female, female to male of different age and characteristics. Besides, you also have Movie Maker and Non Human Voice such as ghost, robot, dog, bird, elephant, etc. And now, you can enhance your funny chat with different voice effects, sound effects, background effects as well as an Equalizer. - Make-ups (1) can give you instant characteristics to your voice such as breathy, raspy, trembling, warm, gentle, etc. with just a click. - You can also choose even more option by selecting Custom (2) to open Equalizer (3) and experience your own set of Make-ups settings. - To add more effects to your real time chat, select Add Voice Effects (1) to open Effects Settings dialog box. - From the Available Effects list (2), choose your favorite effects. In Effects Settings dialog box, Voice Effects and Background Effects are the two noteworthy to be explored. With Voice Effects, you can modify and alter the vocal. On the other hand, choose a background may have some significant impression when saying you are at somewhere no in your room. For example, you can even fool your friends that you are drunk and talking from a forest. The Voice Effects panel gives you the ability to active or disable an effect very easily. - Click on the effect to turn it on. The active ones will have blue color. - The disabled effects are empty. And now, what do you say? The only job left is to connect AV Voice Changer Software Diamond to your VoIP program. Skype, Viber, TeamSpeak, Ventrilo, any program can be connected, enjoy your call.